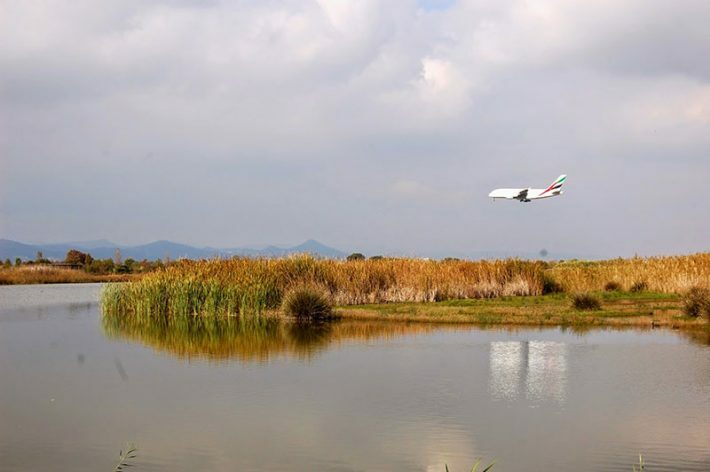 In Barcelona, we are surrounded by water: on one side we have the Mediterranean sea, then the Besòs river to the north and the Llobregat river to the south. It doesn’t rain often, which makes the city very enjoyable, but on the other hand this also results in water shortage and poor quality tap water. El Comidista gave the tab water from Barcelona a -2 out of 10 rating! Even so, the tab water is safe to drink, which is why we offer our guests filtered tab water in reusable glass bottles. That way they don’t have to buy plastic bottles which saves time and money, and more significantly, plastic waste and also the emissions from transportation. Our bathrooms are designed to use as less water as possible, without sacrificing the guests’ experience. We achieve this through aerators, little pieces that mix the water with air and hence saves up to 50% water. It has been shown that visualising consumption helps people use less. 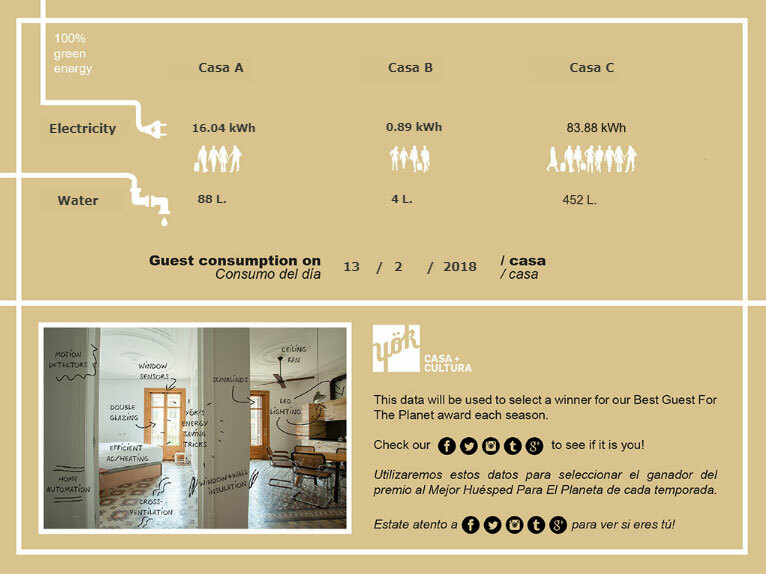 We therefore show the water (and energy) consumption of each apartment in the entrance hall (above image). In our office we installed a toilet that recycles the grey water from the sink. 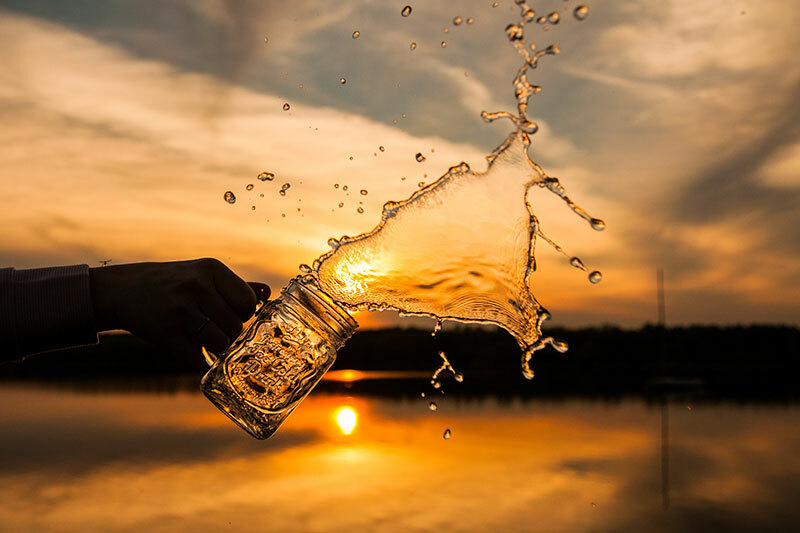 • Take a chilled reusable water bottle from home, as well as reusable cutlery and so on. • Share photos of marine life affected by plastic to get others to recycle and use less plastic as well. • Wait enough time for your suncream to soak in before getting into the water. Suncream that washes off has a negative affect on plants and animals in the sea. Choose organic sunscreens or paraben-free creams; they are both healthier for you and the planet. • Try to avoid buying objects that only last a day or two, like cheap sunglasses or hats. • In short: leave nothing but footprints, take nothing but photos. “Our oceans, waterways, and the life they contain are so much more than their ecological, economic, and educational value. They have vast emotional benefits. They make life on earth possible, but also worth living,” says Nichols.